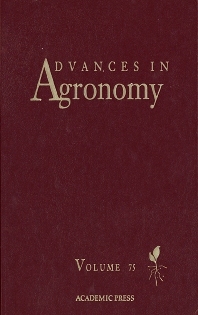 Advances in Agronomy has the highest impact factor among serial publications in agriculture. The Science Citation Index, 1986, reports an impact factor over 2,459 and a cited half-life over 10 years. Volume 75 contains four outstanding reviews dealing with phytoremediation, issues related to water use in China, humic substances, and remote sensing. Chapter 1 is an extensive review on phytoremediation of metals, metalloids, and radionuclides, including discussion on phytoextraction technologies, hyperaccumulator plants, chemically induced phytoextraction, and phytovolatilization. Chapter 2 covers the conservation and use of water in Chinese agriculture including engineering, economic, and agronomic aspects and considerations. Chapter 3 presents advances in understanding the structure of humic substances, particularly the concept of a supramolecular structure. Analytical and molecular scale evidence for this latter structure are presented as well as discussions on the role of humic superstructures in soils. Chapter 4 presents frontiers in quantitative remote sensing of soil properties including principles, methods, mechanisms, and limitations.